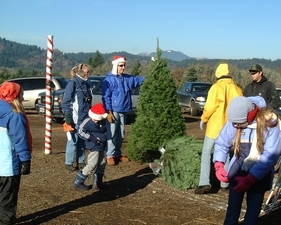 We are no longer open for families to cut their own tree. But here are some photos from those years. Thank you for your support of our choose and cut! 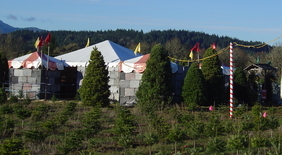 Harvest Your Own Christmas Tree! For other days, please call for an appointment. 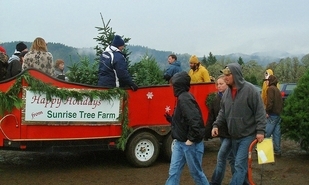 Bringing in the trees on Santa's Sleigh. Game #1: Frosty Needs A New Nose! See if you can get the carrot to one of the Frosty the Snowmen. Game #2: Rope a reindeer! Santa needs help gathering his reindeer. Can you help lasso a Reindeer? Game #3: Help Santa Pack his Sack! Can you help Santa pack presents in his pack or in the stockings by the fireplace? Game #4 The Elves are Hungry! The elves have been working hard to get all your presents ready for Christmas. Can you toss the elves a piece of candy? They deserve a treat! We are revamping our farm tours to take place in April, May, September and October. Better weather and more fun. From grade schools to senior center groups, the tour is tailored to fit the age level and interest. Please book in advance by calling 541-929-2289. See our "Ecology Tours" page.